Back in April, Salt Lake Magazine asked me if I would contribute a few honey recipes for the Best of the Beehive issue. Of course I said yes, I was thrilled when I received the invitation. The issue is “hot off the press” and on newsstands in Utah right now. I know not everyone lives in Utah, so I am sharing a “behind the scenes” post today. 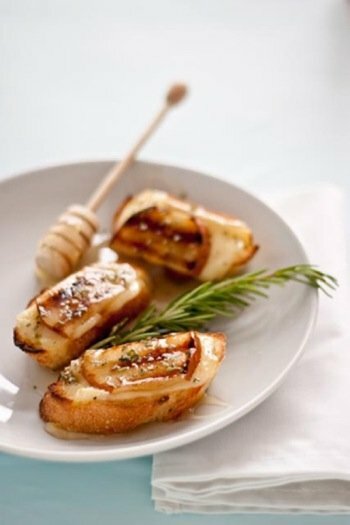 Because I love you all so much, I am also sharing my grilled pear, brie, and honey crostini with fresh rosemary recipe that is featured in the magazine. Utah is known as the “Beehive” state. Our state insect is the bee and the beehive is also the official state seal. I am not a honey connoisseur, but I know Utah’s honey is top notch. I had a lot of fun creating honey recipes for the magazine. We did a few test runs with the recipes and even invited family and friends over to sample. We decided to submit our three favorite honey recipes: Grilled Pear, Brie, and Honey Crostini with Fresh Rosemary, Grilled Salmon with Honey-Orange Glaze, and Honey Yogurt Cake with Fresh Berries and Whipped Cream. The photo shoot was at Heidi Larsen’s house-Salt Lake Magazine’s Senior Art Director. She let us use her gorgeous kitchen for the shoot. We prepared and prepped the food for the shoot and let Heidi work her magic. She is an amazing photographer with fantastic style…and she has the cutest dogs. We had a wonderful day in the kitchen. I didn’t see any of the photos until Josh brought the magazine home on Monday night. I am very pleased with the outcome. It is still kind of weird seeing myself and my recipes in a magazine, but I love it. 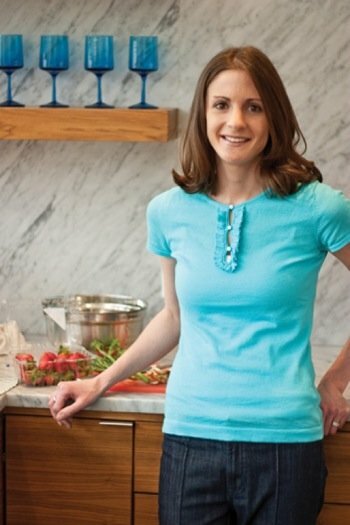 Thanks Salt Lake Magazine for featuring my recipes. Also, a big thank you to Heidi for letting us post your stunning photos on our blog. We really enjoyed working with you. If you live in Utah, make sure you pick up a copy today. The entire issue is a must read! You can find all three of my recipes in the magazine, but today I am sharing the grilled pear, brie, and honey crostini with fresh rosemary recipe. It is one of my favorite appetizers. 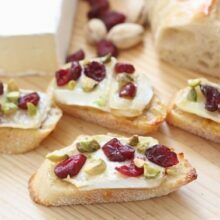 This crostini is perfect for entertaining-everyone loves it. 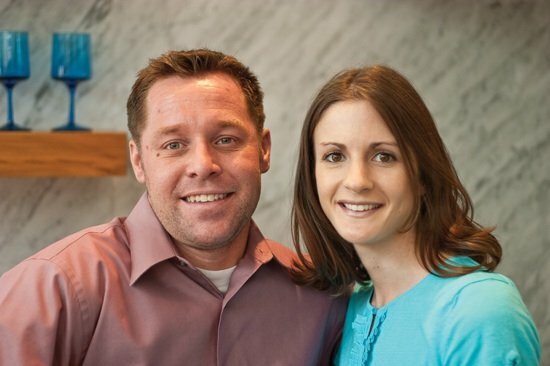 You can follow Salt Lake Magazine on Facebook-they posted some photos of us on their page. How cool! You’re going to be famous…just saying 😉 The photos turned out great. Love the outfit you choose. And the recipes look so good. A great blend of flavors. Congrats! You guys are such a gorgeous couple! And the crostini is making my mouth water. Yum. Congrats on the magazine article! These dishes look perfect for a photo shoot. The pictures and recipes look great! You two were made for the camera 😉 What a fun experience for you guys. Thanks for sharing. How great! Love the pictures. The Crostini looks scrumptious. Congratulations on the article! I have a peach, Brie and honey Panini in my upcoming book and love your crostini. Your photos are wonderful, and I look forward to your posts everyday. how exciting! love the photos 🙂 and these crostini sound fabulous!! The photos turned out great, and the article is awesome! You did Salt Lake proud! What a wonderful feature! That recipe sounds amazing! Delicious, love cheese and honey–the ultimate combination. Your photo shoot looks amazing, many congrats! Your crostini is just beautiful and sounds delicious! Congratulations on your magazine feature story as well. How exciting! Congratulations Maria! You guys look beautiful (love your top!) and the recipes are to die for. Well deserved. Can’t wait to make the crostini, a perfect summer appetizer! Congrats for the feature! You both look great, and the food looks irresistible! Congratulations!!! Your recipes sound fantastic & those photos are beautiful!! Oh my gosh, how exciting! The pictures are great, and seriously that recipe is making me crave honey and brie! Soooo good! That color blue looks awesome on you! Thanks. I didn’t know it would match the kitchen props..ha! Mmm…that looks and sounds amazing! But I’m most interested in the honey cake recipe. Is there any way to get ahold of it outside of Utah? And congratulations on being published! You sure are one cute couple! 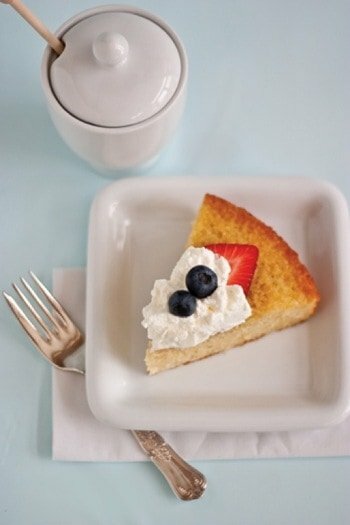 I will try to post the honey yogurt cake in the near future. Thanks! Maria!! This is SO EXCITING!! I so wish I lived in Utah so I could grab a copy of this magazine!! I knew you were going to be famous from the moment I met you 😉 Your pics look great (and so do you! and hubs!) and that recipe looks delicious. I can’t wait to try it! I miss you tons & hope we can catch up soon! CONGRATULATIONS on being a local celebrity! Your comment made my day. Thanks friend! First of all you guys are THE cutest couple. Second of all, CONGRATS! That crostini recipe sounds fantastic. I bet it would make for an awesome grilled cheese also. Congratulations; I love seeing the photos! Sounds like a lot of fun. Everything looks delicious! Great job on the recipes! Such fabulous photos, forget about the crostini……you guys look terrific! Arent you two cute as heck! Congratulations! I’ll have to have my mom send me a copy. That’s so exciting. The pictures are fantastic, and the food looks even better. The crostini looks incredible (I love brie with pears or apples), but more importantly, you and Josh look fabulous! How fun to get to do a photo shoot – the photos turned out awesome. Be very proud! You guys are the cutest ever!! Love the looks of your recipes too! Have a great day girl!! Congrats! What an awesome feature! 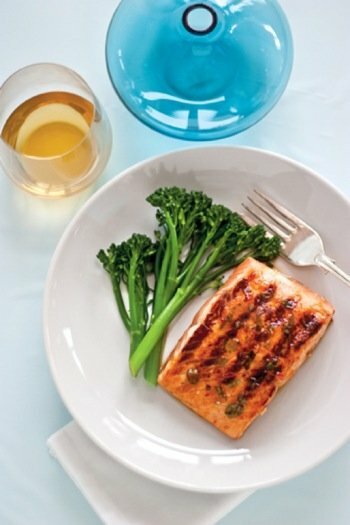 I would love to have the Grilled Salmon with Honey-Orange Glaze for dinner tonight. Yum! How wonderful. I will for sure try this recipe. I am going to pick up a copy on my way home from work. What an exciting opportunity. This crostini sounds wonderful. OMG…that looks so delicious. Congrats on the magazine spread…it’s so amazing! You look fantastic…and your hubs is so handsome! Maria, congratulations! You are so beautiful – and what a lovely summer appetizer! You and Walter Dan are looking quite amazing! Love this! Congrats, Maria! PS… Can I say I know you? A perfect recipe. Rosemary adds the right touch. I think we should eat more honey and less sugar. I like honey when it’s mixed with savory. CONGRATULATIONS!!! Fabulous recipe, and what a beautiful couple! Congrats on having your recipe published in a magazine. You are very deserving. Those crostini look wonderful. The honey, cheese, and pears are a wonderful combination. 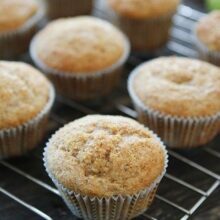 What a lovely recipe – great ingredient combination! How great!! Wish I was still out there to grab a copy. You guys look great! And the recipe…yum! Mmm, I can just imagine how good those must taste! I feel like I know somebody famous! Great recipe… it looks delicious. Seriously, how awesome are you?! great pictures–that’s so exciting for ya’ll! Well aren’t you two the cutest? 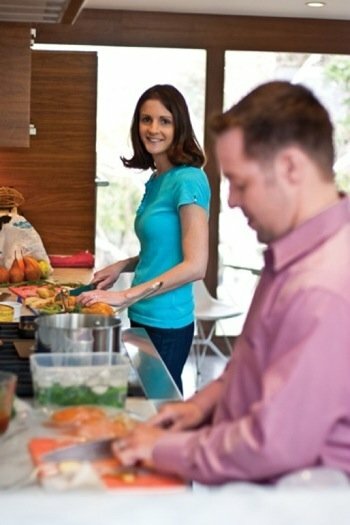 Fantastic couple, fantastic recipes! Love the look of that salmon. oh yum!!! and you both look amazing!! congratulations!!! I picked up the magazine and it’s a beautiful spread. Well done, Maria and Heidi. This crostini recipe immediately caught my eye. Y’all look so cute!!! That looks like such a fun day too. And the photos turned out lovely. That looks heavenly! 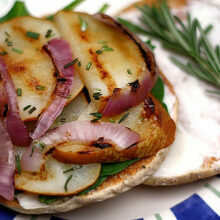 I love pear & brie paninis but it actually never occurred to me to put them on crostini. The photos from the shoot look great! How fun! This crostini looks DIVINE. Girl, you guys outdid yourselves! I dont know how I missed this post but I’m glad I found it! The crostini looks great! 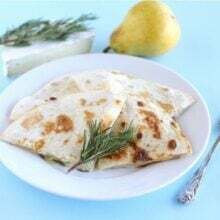 I make a blue cheese one with pears and sage and its one of our favorite recipes. I’ll have to give this one a try too. yum! I make a sorta-similar crostini but use ricotta instead of brie. Looks fabulous! What an interesting combination with the pear, brie and honey. It sounds delicious. I want to eat those crostinis every single day of my life they look so good.